Note: This service is coming soon. Telemedicine allows us to harness modern technology and telecommunications to provide interactive healthcare. 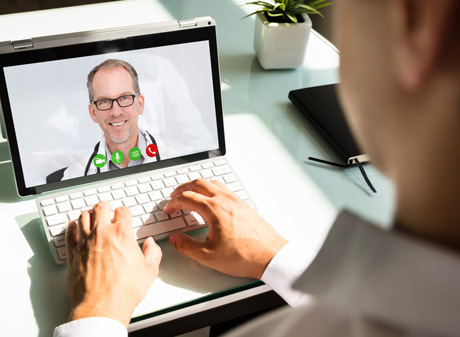 By bridging geographic distance, patients will be able to visit with physicians of various specialties over video conferencing in order to receive an immediate diagnosis and treatment plan, or at the very least provide the physician with data in order to come up with a diagnosis and follow-up plan at a later time. Unfortunately, physicians often lack the time necessary to dig into a patient’s chart history and symptoms to uncover the true cause of pain or other conditions causing their suffering. This leaves patients and physicians alike feeling helpless about what to do in some cases to alleviate the problem. Physicians of all kinds of specialties from across the country can talk about patients and come up with solutions. Patients can use video and the internet for consultations and follow-up visits with various providers. This service will be available for a flat fee. Some insurances cover a portion of a telemedicine consultation, so we can check your eligibility and adjust your cost if it is covered. This is a brand-new service we are implementing and will be building in more patient benefits in the near future. Telemedicine is a convenient clinical care service for certain conditions available through internet-connected computers or mobile devices. Telemedicine may be used for common issues such as back pain, joint pain or strains, medication counseling/refills, or coordinating urine screens. This is not for medical emergencies. Please call 911 or go to the nearest emergency room for anything critical or a major medical problem. Will providers have access to my medical records? This department is staffed by both Lynx Healthcare and contract providers. All of our staff will have access to the medical history you provide through the portal. Additionally, our Lynx Healthcare providers will have access to all charts, notes, and medical history if you are a current patient. Can I get prescriptions through a telemedicine consult? Lynx Healthcare and contract providers will be able to prescribe the appropriate medication for your personal diagnosis. Be aware that federal and/or state laws don’t allow any narcotics/opiates to be prescribed through telemedicine consultations. There may also be certain medications that may require an in-office visit per Lynx Healthcare policies. Do telemedicine consults count as a qualified HSA or FSA expense? Yes, these qualify as health care expenses. We are able to treat many common, nonurgent conditions or situations. If we aren’t able to diagnose your condition or resolve your issue and require that you be seen in person in order to do so, we will not charge you for the telemedicine consult.